When you’re making a sophisticated, complex, grown-up grilled cheese, you need something a little sturdier than white bread. 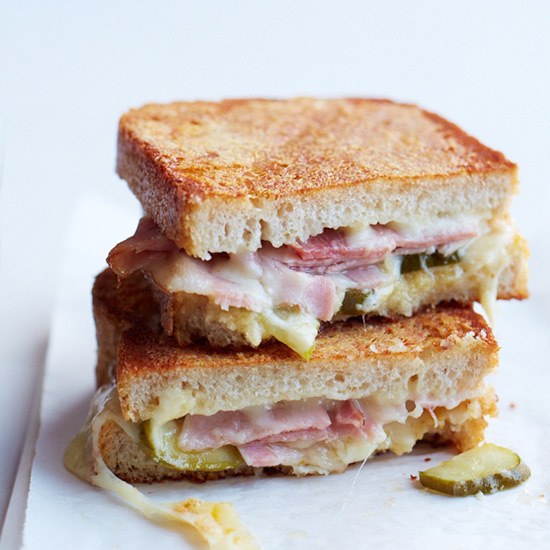 Here, the best breads for grilled cheese sandwiches. When you’re making a gooey, stuffed grilled cheese pocket (like the one in this week’s episode of Mad Genius Tips), you need a soft, pliable white bread. But when you’re making a sophisticated, complex, grown-up grilled cheese, you need something a little sturdier. Here, the best breads for grilled cheese sandwiches. A crustier step up from basic white bread but still soft and airy, Pullman bread is a great gateway bread for those looking to make a more artisanal sandwich. To upgrade it, try sprinkling slices with extra cheese before grilling the sandwich for a super-crisp, cheesy crust. Give your gooey, cheesy sandwich the illusion of healthiness by making it with hearty multigrain. The rich, grain-studded bread can stand up to lots of flavors. Try it with a mix of Manchego, smoked cheddar and Gouda. Tangy, crusty sourdough is the ultimate grown-up grilled cheese bread. Try it with pungent Époisses and pepper jelly. Perfect for a handheld meal on the go, English muffins are underused when it comes to grilled cheese sandwiches. The nooks and crannies are especially great when it comes to ultra-melty soft cheeses like triple-crème or brie. Spongy with a firm but forgiving crust, this Italian white bread is best cut into thick slices for a hearty, filling sandwich. We like it topped with Manchego, apple slices and chunky parsley-walnut spread. Dark, malty pumpernickel is a fantastic foil for bright flavors like the mango chutney in these grilled ham and cheddar sandwiches.